This example requests two 3-stage group sequential designs for normally distributed statistics. Each design uses a Haybittle-Peto method with a two-sided alternative and early stopping to reject the hypothesis. One design uses the specified interim boundary Z values and derives the final-stage boundary value for the specified and errors. The other design uses the specified boundary Z values and derives the overall and errors. The "Design Information" table in Output 101.5.1 displays design specifications and maximum information in percentage of its corresponding fixed-sample design. The "Method Information" table in Output 101.5.2 displays the and errors and the derived drift parameter, which is the standardized alternative reference at the final stage. With the STOPPROB option, the "Expected Cumulative Stopping Probabilities" table in Output 101.5.3 displays the expected stopping stage and cumulative stopping probability to reject the null hypothesis at each stage under various hypothetical references , where is the alternative reference and are the default values in the CREF= option. The "Boundary Information" table in Output 101.5.4 displays information level, alternative references, and boundary values. By default (or equivalently if you specify BOUNDARYSCALE=STDZ), the standardized Z scale is used to display the alternative references and boundary values. The resulting standardized alternative reference at stage k is given by , where is the alternative reference and is the information level at stage k, . At each interim stage, if the standardized statistic , the trial is stopped and the null hypothesis is rejected. If the statistic , the trial continues to the next stage. At the final stage, the null hypothesis is rejected if the statistic . Otherwise, the hypothesis is accepted. Note that the boundary values at the final stage, 1.65, are close to the critical values 1.645 in the corresponding fixed-sample design. The "Error Spending Information" in Output 101.5.5 displays cumulative error spending at each stage for each boundary. The stage 1 spending 0.00135 corresponds to the one-sided p-value for a standardized Z statistic, . 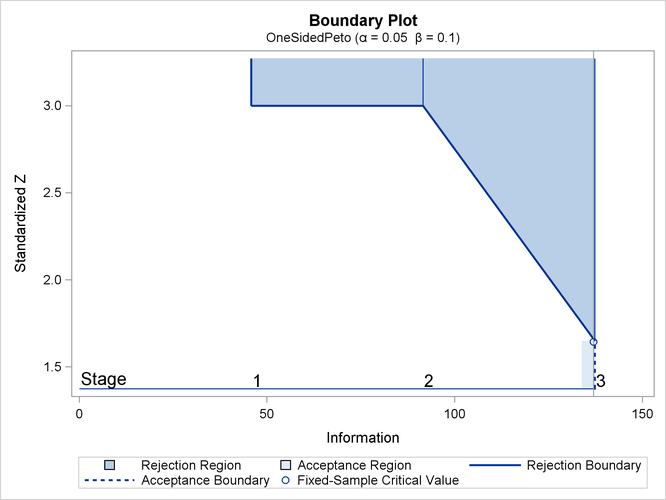 With ODS Graphics enabled, a detailed boundary plot with the rejection and acceptance regions is displayed, as shown in Output 101.5.6. With the STOP=REJECT option, the interim rejection boundaries are displayed. With the PLOTS=ERRSPEND option, the procedure displays a plot of error spending for each boundary, as shown in Output 101.5.7. The error spending values in the "Error Spending Information" in Output 101.5.4 are displayed in the plot. 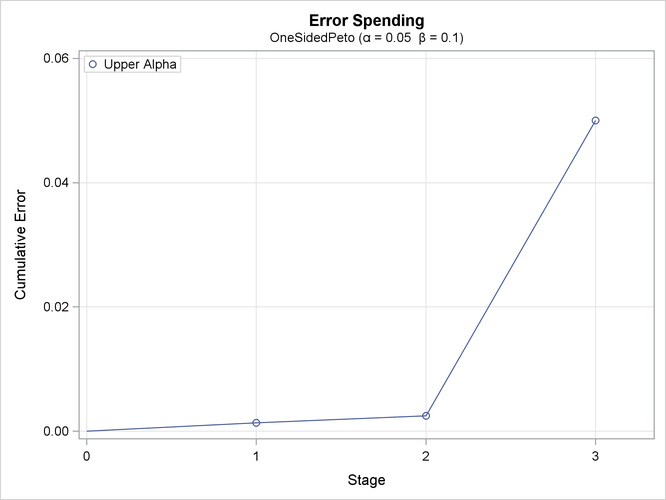 As expected, the error spending at each of the first two stages is small, with the standardized Z boundary value 3. The "Design Information" table in Output 101.5.8 displays design specifications and derived and error levels. The "Method Information" table in Output 101.5.9 displays the and errors and the derived drift parameter for each boundary. With the STOPPROB option, the "Expected Cumulative Stopping Probabilities" table in Output 101.5.10 displays the expected stopping stage and cumulative stopping probability to reject the null hypothesis at each stage under various hypothetical references , where is the alternative reference and are the default values in the CREF= option. The "Boundary Information" table in Output 101.5.11 displays information level, alternative references, and boundary values. The "Error Spending Information" in Output 101.5.12 displays cumulative error spending at each stage for each boundary. The first-stage spending 0.00135 corresponds to the one-sided p-value for a standardized Z statistic, . 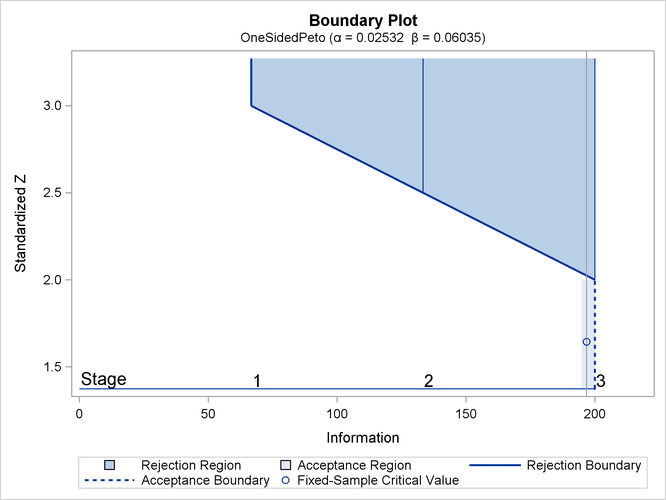 With ODS Graphics enabled, a detailed boundary plot with the rejection and acceptance regions is displayed, as shown in Output 101.5.13. With the STOP=REJECT option, the interim rejection boundaries are displayed. With the PLOTS=ERRSPEND option, the procedure displays a plot of error spending for each boundary, as shown in Output 101.5.14. The error spending values in the "Error Spending Information" table in Output 101.5.10 are displayed in the plot.